When using k-nearest neighbors, an unknown object is classified by comparing it to all the prototypes stored in the training database. When the size of the database is large, and especially if prototypes are represented by graphs, the search of k-nearest neighbors can be very time consuming. On this basis, some researchers have tried to propose optimization techniques to speed up or to approximate the search of the nearest neighbors of a query. However, these studies pay attention only to the case of vector space. 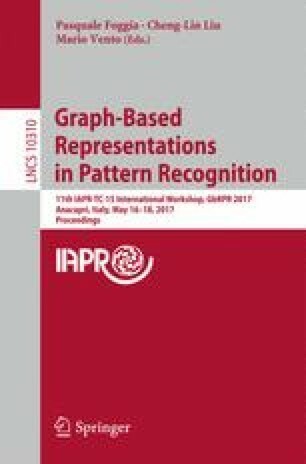 In this paper, we propose an optimization technique dedicated to structural pattern recognition. We take advantage of a recent branch-and-bound graph edit distance approach in order to speed up the classification stage. Instead of considering each graph edit distance problem as an independent search tree, the search trees whose purpose is to classify an unknown graph are considered as a one search tree. Results showed that this approach drastically outperformed the classical one under limited time constraints. Moreover, this approach beat fast graph matching algorithms in terms of average execution time.